Marty with Hmong elders in Wisconsin. Marty Harris is a graduate of Miami University, Oxford, Ohio, with teaching certification and a bachelor’s degree in English. She completed an art major through the University of Wisconsin system, and holds a master’s degree from Aurora University in Curriculum and Instruction. Marty began her teaching career working with junior high students in inner city Columbus, Ohio. Early in her career she taught composition and writing to students of the Ho Chunk Tribe near Black River Falls, Wisconsin. For 20 years she taught in the Wausau School District, Wausau, Wisconsin, in the fields of English and art. Marty worked with Very Special Arts-Wisconsin to develop a curriculum in which students with exceptional education needs could participate in art to the fullest extent of their capabilities, and served on the board of the state organization. She was recognized by the Marathon County Department of Special Education as “Support Teacher of the Year” for her efforts on behalf of disabled students. 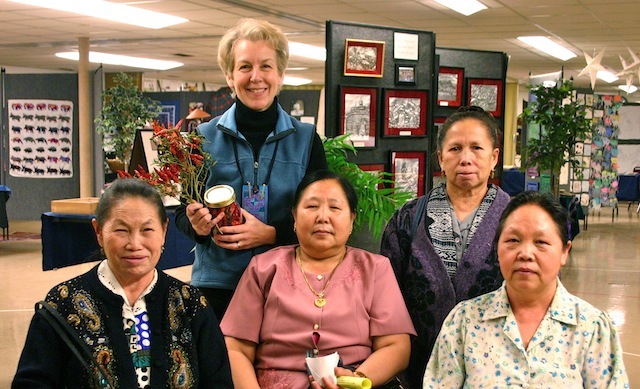 As the enrollment of Hmong-American students grew in Wausau’s elementary schools, Marty committed herself to learning more about Lao and Hmong culture. To this end she has traveled to Southeast Asia to meet the extended families of her Hmong-American students and to collect artwork and other artifacts related to Hmong culture.